Serious gaming is an essential tool for strategic planning, training for crisis situations and education. 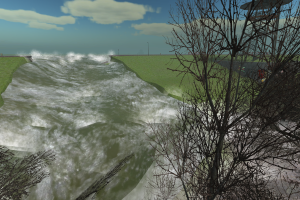 Deltares has developed serious games for various aspects of life in delta regions. The games typically combine knowledge about environment and infrastructure, game rules that reflect the span of control of the stakeholders and a realistic visualisation of the area. Our serious games are played by policy makers, students, water managers, levee patrollers and the general public. Serious games challenge players by simulating realistic problems. Players can try out a range of options and they can see the practical implications with no delay. This gives them the opportunity to train in a safe environment and avoid disastrous situations. The realism of serious games heightens the experience and helps to get the information across. The games encourage discussions between participants and the exchange of information, promote teamwork and allow players to understand better the processes they are involved in. Deltares develops serious games with a range of aims: for the preparation of strategic decisions, to support operational activities or to raise awareness of sustainable options. Deltares can take care of the entire development process; the planning, preparation and implementation of the production pipeline including project management and the provision of a team capable of delivering the required solution.